Check out the 2018 red carpet photo booth pictures on the Dal Student Life Facebook page! Dalhousie students are known for their academic excellence, but their achievements outside of the classroom are equally impressive. 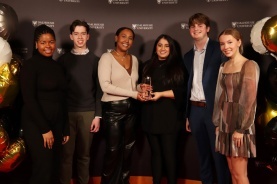 The Dalhousie IMPACT Awards is an annual event hosted by the DSU in collaboration with Dalhousie University, to recognize outstanding individuals and student groups that impact our community. The 2018–19 IMPACT Awards gala is on Thursday, March 21, 2019. Individual award categories include Academic Life, Student Life and Community Service, and Residence Life. Nominations for the 2018–19 IMPACT Awards close on February 8, 2019. Also presented at this event are the Board of Governors' Awards. Nominations for the Board of Governors' Awards close on January 11, 2019. Nominations for the 2018–19 IMPACT Awards close on February 8, 2019. Do you know someone who should be recognized? Read about all the categories here. The Board of Governors' Awards are the top student awards at Dal, presented at the IMPACT Awards gala. Nominations close on January 11, 2019. The 2018–19 IMPACT Awards gala will take place on March 21, 2019 in the McInnes Room (SUB). Watch here for information on free tickets and check the Facebook event page for updates.